Do you ever have an area of your home that just drives you crazy? Well, for me that was the carpet in my living room. We've lived in our home for almost 7 years and this carpet was probably installed right before we moved in because it was in pretty good condition back then. Fast forward 7 years, 2 kids and 2 dogs later and it was in a pretty bad state. Over the years I've tried cleaning it myself, getting it professionally cleaned, and using all kinds of green and not so green cleaners. But this past summer (my break off from teaching) I just had enough; it was time for a change. We decided to go with Lumber Liquidators mainly because of the competitive pricing and available sales. 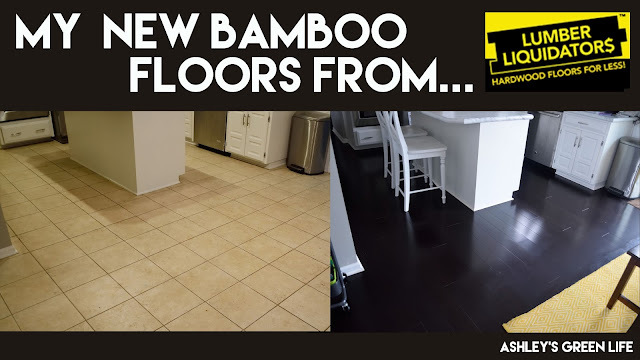 The type of flooring we decided on was: Midnight Ultra Strand Bamboo by the brand Morning Star in the size 9/16"x 5-1/8" we ordered 614 sq ft. our's came with a 100 year transferable warranty Our's was a glue and nail down install. To purchase the flooring it cost around $3.19 per sq ft. and we ordered 614 sq. ft. worth totaling that to $1959. Brining my total cost to: $6,000 Pretty steep I know, but it was something that we had been saving for for a while and feel is so worth the cost to change the look of our main floor and a nice greener alternative to carpet or traditional hardwood floors. Overall I was really impressed with the way the floor turned out and the entire process in working with Lumber Liquidators. I highly recommend them if you are looking to redo your floors. So a big thanks to Jose and the rest of his team for the work they did in our home as well as the Lee's Summit store here in Missouri that helped us during the process, we couldn't be more pleased with our experience. Just a reminder, I am not getting paid by Lumber Liquidators, and this is not a sponsored post. I purchased this product with my own money and this is my honest opinion of it. If you've used Lumber Liquidators before, share your experiences below. Or if you also have bamboo flooring, tell us about it below!